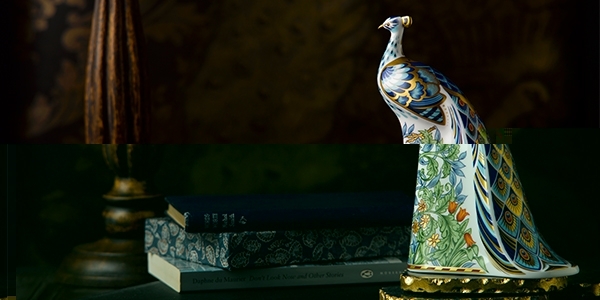 Autumn is well and truely underway in the UK, so what better way to celebrate this wonderful season than to launch Royal Crown Derby's latest introductions as part of the Giftware Range. Exceptionally colourful detail of symmetrical blooms of wild forest flowers, tulips and acanthus adorn the base of this stunning William Morris inspired Manor Peacock. Using designs synonymous with archetypal stylised flora and fauna textile patterns made famous by the iconic British designer, who expressed luxuriant naturalism in every pattern he created bringing pattern into the home during the 19th century. Beautiful shades of tonal blues with touches of orange sweep along the body and tail feathers of this stunning fine bone china piece. 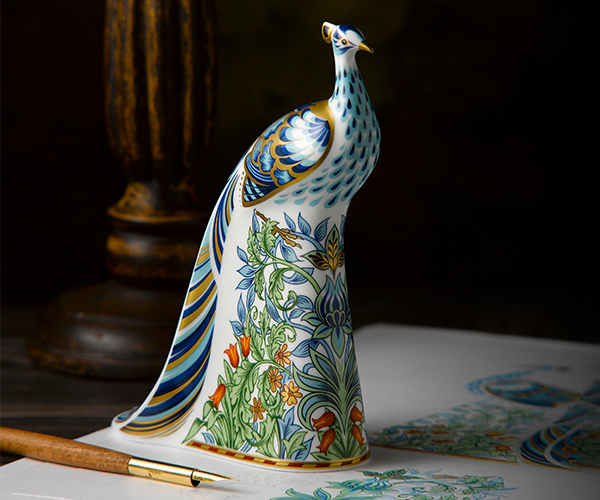 Geometric shapes depict the peacock’s plumage and tail feathers with outstanding colour, which contrasts perfectly with the nature inspired design adorning the base in soft hues of pale green, powdery blue and subtle orange tainted with flecks and embellishment of 22 carat gold making this a stunning piece to adorn any home. 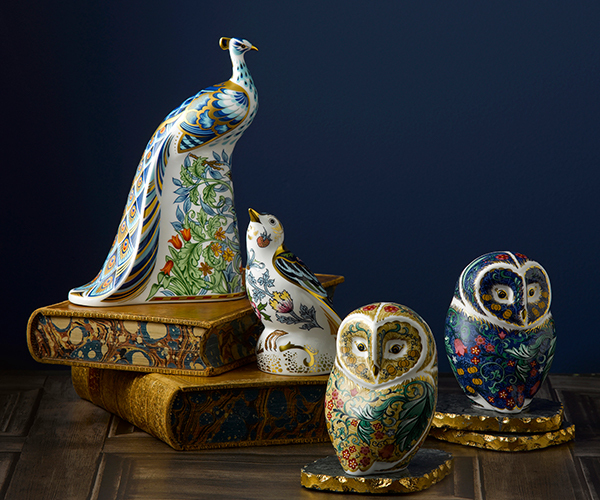 Designed to accompany Royal Crown Derby’s William Morris inspired giftware collection including The Strawberry Thief Thrush, Parchment Owl and Periwinkle Owl. Each designed using stunning surface patterns inspired by the works of William Morris, perfect to celebrate this wonderful design icon. View the Manor Peacock here. 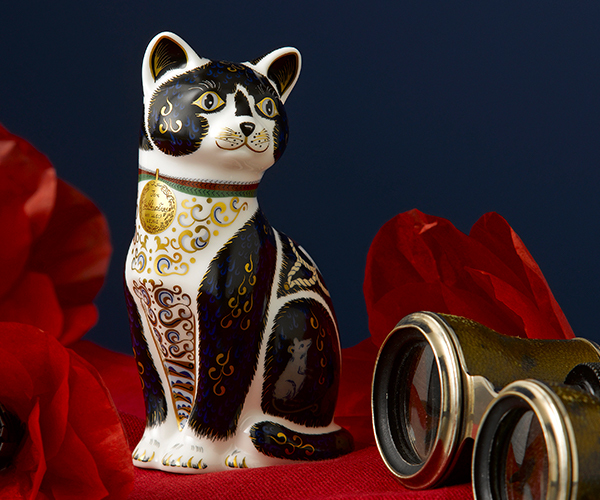 Inspired by Able Sea Cat ‘Simon’, the limited edition of 500 War Cat joins Royal Crown Derby’s collection of giftware commemorating the service of military animals. Simon was awarded the PDSA Dickin Medal and Blue Cross for his exemplary service aboard H.M.S Amethyst, protecting food stores on board the ship from rats and raising morale among the navy servicemen, despite being severely injured during the Chinese Civil war known as Yangtze Incident in 1949. Decorative swirls of blue and 22 carat gold adorn the black and white body of the cat depicting waves, with illustrations of rats scurrying around the base of the H.M.S Amethyst, life buoy and anchor designed to commemorate Simon’s heroic deeds in saving the lives on board, the PDSA Dickin Medal awarded to Able Sea Cat ‘Simon’ draped around his neck in 22 carat gold on this stunning limited edition piece. View the War Cat here. Introducing the majestic Golden Eagle. Symbolising power, strength, beauty and grace, the eagle has been beautifully designed with detailing in the delicately outlined feather work shaded in earthy shades of burnt orange and a tonal range of browns to bring to life the natural beauty of the bird, embellished in 22 carat gold as part of the feather detail and key features such as the beak, tail feathers and talons. 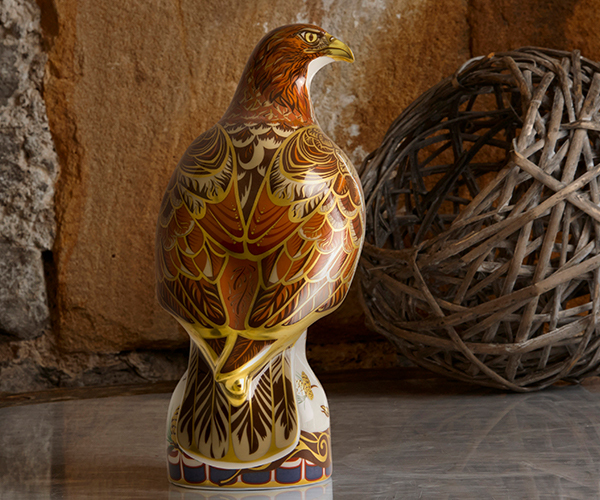 The base features the eagles prey and spruces native to Northern America and Canada inspired by totems drawing on the prominence the Golden Eagle has in Native American and Canadian culture. Being highly regarded as a sacred bird of prey particularly associated with courage, wisdom, leadership and magic as the golden eagle is seen as man’s connection to the divine as it flies higher than any other bird and can deliver messages to and from the spirit; they play a major role in the religious ceremonies of many tribes. For those collectors of the prestigious limited edition collection there will be no disappointment with the limited edition Golden Eagle, presented in its own gift box together with a numbered certificate. 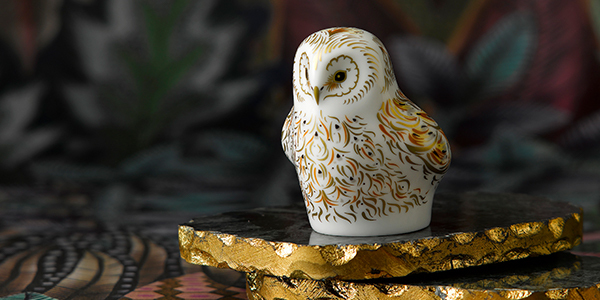 The Owlet is a perfect addition to Royal Crown Derby’s wonderful owl collection inspired by these glorious birds of prey. Warm tones of yellow, grey and russet adorn the body of this superb piece with flecks depicting the fluffy feather down young owls have while they mature and their plumage grows. With 22 carat gold detailing adds beautiful highlights to the fine bone china piece giving a special finishing touch to this wonderful owlet. 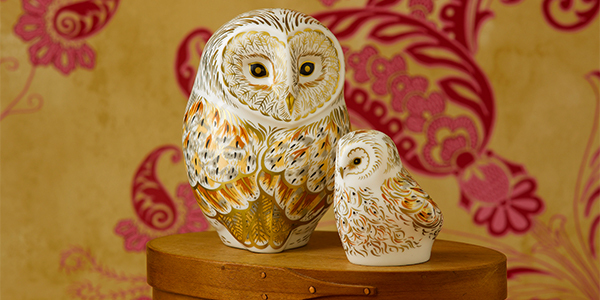 Designed to pair with the Winter Owl adorned in the same swirling pattern inspired by the playful characteristics of these stunning birds, creating a spectacular parent and child match. Don’t forget you can get 10% off your first order with Royal Crown Derby by using the code NEWUSER10.